Welcome to The Islander! This massive beachfront condominium complex has so many amenities you won't have enough time to take advantage of them all! Emerald Coast by Owner is proud to offer you a large variety of luxurious properties all throughout the complex. 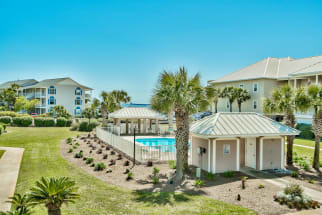 When you stay here, you will be able to take in the lovely scenery, swim in the elegant pool, relax in the hot tub, play shuffleboard, go on walks on the beach (provided it's conveniently close) and so much more. Outside of the complex is a number of fun activities offered to you everywhere! Parasailing, deep sea fishing, golfing, jet ski rentals, boat tourism, paddle boarding and so much more. Some people even love to just play sand volleyball or hangout on the beach which is always a good time! Want to relax Like I said, hit the hot tub, lay by the pool, lay on your balcony or on the beach, and even go to a spa! Are you worried about groceries and essentials Not an issue. There's plenty of local grocers carrying anything you could need! When it comes to food down here, you can shop at the grocery store and cook at the condo, or go to a delicious fresh seafood spot! Even a traditional spot if you desire. There's a number of great food spots with good food, drinks and service! We recommend you try the Sunset Grille and Bud & Alley's Restaurant! Visit us at Emerald Coast by Owner to book the best vacation rental you have ever had at The Islander along Holiday Isle in Florida. When you book with Emerald Coast by Owner, we make it easy for you to choose where, when, and what you want to do on your trip. Contact us with any questions!